Is it Legal to Own an Otter in Nevada? Few animals are as cute as fun-loving and furry otters. They are small, sleek, playful, and they even hold hands while they sleep in the water! What could be cuter and more exotic than owning an otter as a pet? With such adorable characteristics, some Nevadans might be in interested in knowing more about whether it is legal to own an otter as a pet in Nevada. What Animals Can be Owned as Pets? Otters are not expressly included in this state statute, and that is because otters are considered to be wild animals under NAC 503.015 and 503.025. There is much debate about whether a wild animal makes for a good pet. Generally, a wild animal, like an otter, cannot be owned as a pet in Nevada without the owner being properly licensed or permitted by the state. Possession of an otter is restricted under state law, but ownership of an otter is not impossible in Nevada. The state regulates the possession of indigenous wildlife. Only someone who is licensed to have possession of live wildlife in accordance with NAC 504.450 et seq. can legally own an otter in Nevada. Generally speaking, so long as an animal is not expressly prohibited under NAC 503.110, it is possible to own a wild animal if you are willing to work through the red tape to secure the appropriate license or permit. Nevada is one of the more lax states when it comes to an individual’s ability to own a wild or exotic animal. It is important to note that the rules regarding otter ownership and the ownership of any other wild or exotic animal may depend on the specific county or city in which you are living. Ownership of an otter in certain localities may be illegal, or the locality in which you live may have more restrictive rules regarding wild animal ownership that other parts of Nevada. It is important to always research the laws and ordinances specific to your home jurisdiction before taking possession of a wild animal like an otter so that you can make sure that you are in compliance with local and state law. If owning an otter is something that you feel like you are capable of doing and is something you would enjoy, then it is important that you obtain the appropriate permits or licenses to legally have possession of such an animal. Please give our office a call. 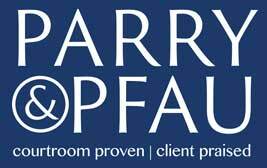 The team at Parry & Pfau is happy to schedule a free consultation with you. Newer PostIs it Legal to Change Your Name? Older PostIs St. Patrick’s Day a Legal Holiday?